Miura introduce shipboard incinerator model "BGW-N", complied with "CE" MARKING of marine equipment directive for EU FLAG starting May.1,1999. and "IMO" MARPOL73/78/97 ANNEX VI starting Jan.1,2000. BGW-N series incinerate simultaneously with waste oil and solid wastes which are processed specified in IIA classII. In order to prevent the pollution of oceans and seas,IMO MARPOL establishes guidelines for solid and liquid waste discharged from ships. Exhaust gas is to be rapidly cooled to 350℃ or less within a space of 2.5meters in the smokestack. The combustion chamber is normally to be operated in a negative-pressure environment. 20kg of solid waste can be put into the incinerator at one time and burned simultaneously with waste oil. Ships with a 25-man crew produce up to about 20 kg of waste per day. Since all this waste can be charged into the incinerator at one time, the work is reduced. At the same time,a fixed amount of waste oil can also be incinerated. Using the unique semi-disrillation-type incineration method,materials containing a lot of water can be burned simultaneously with producers of high heat such as plastics.Furthermore, since this incinerator can be opened from both sides of the burner, it can easily repaired and maintained. The combination of spesialized fan and enhanced combustibility air-atomizing burner help to support efficient vaporized incineration. Purge, ignition, combustion and cooling within the incinerator are all controlled automatically (Required job is the switching operations of the cooling fan and insertion of combustion only.) During incineration, various safety limit switches monitor operations to reduce hazards. *When waste oil is in extremely bad condition, the pilot burner and waste oil burner are set to incinerate simultaneously. The ejector, which is installed at the incinerator exit,maintains the negative pressure within the incinerator and cools gases by mixing them with diluted air. In conventional incinerators, exhaust gases coming from the incinerator contain many corrosive gases,so the fan is corroded in exhaust systems that use a suctioning fan. 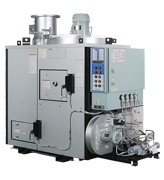 However, with the model BGW-N incinerator, the ejector system protects the fan from corrosive gases. Dioxins sre formed when incompletely burned waste at incinerator exit combines with chlorides in a temperature environment of 300-400℃ However,the model BGW-N incinerator is equipped with an ejector at the exhaust duct that mixes exhaust with cold air and it instantaneously to 200℃ or less to sappress the formation of dioxins.